1. Run the Projetex Server Administrator. Switch to the Database tab. 2. On the Database tab click Backup. 3. In the Backup Database window specify the backup path (i.e. the location of the future backup file) and change the backup file name if necessary. To create the backup file click OK.
4. When the backup procedure is over, copy the backup file to a safe storage location (which will not be formated). 5. Close Projetex Server and Workstations and manually copy your database to a safe place, i.e. copy the entire C:\Program Files (x86)\Microsoft SQL Server\MSSQL12.P3D\MSSQL\DATA folder to a different location. 3. Run the Projetex Server Administrator. Switch to the Database tab. 4. Click the Restore button. 5. 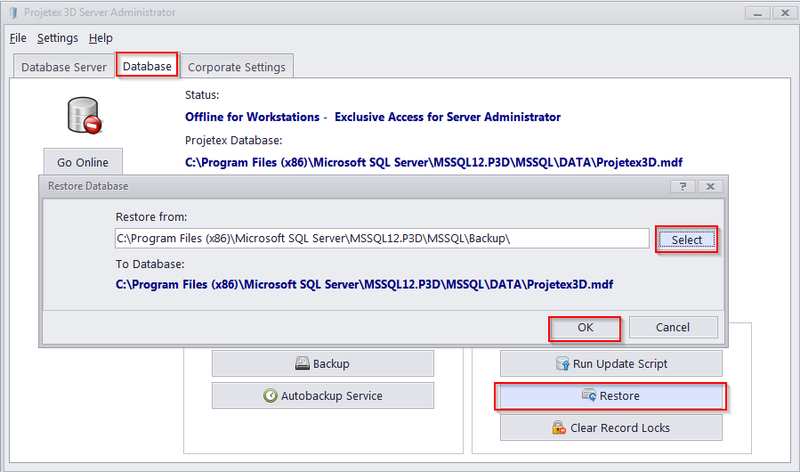 In the Restore Database window specify the location of your backup file and click OK.
6. Your Projetex software with all your data is ready!